Donald Trump’s decision to impose import tariffs—on solar panels and washing machines now, and perhaps on steel and aluminum down the line—has once again opened up the war concerning international trade. It’s not a trade war per se (although Trump’s free-trade opponents have invoked that specter, that the governments of other countries may retaliate with their import duties against U.S.-made products), but a battle over theories of international trade. And those different theories are related to—as they inform and are informed by—different utopian visions. In one sense, Trump and his supporters are right. Capitalist free trade has destroyed cities, regions, livelihoods, and industries. The international trade deals the United States has signed in recent decades have been rigged for the wealthy and have cheated workers. They are replete with marketing scams, hustles, and shady deals, to the advantage of large corporations and a small group of individuals at the top. But Trump, like all right-wing populists, as I explained recently, offers a utopian vision that looks backward, conjuring up and then offering a return to a time that is conceived to be better. For Trump, that time is the 1950s, when a much larger share of U.S. workers was employed in manufacturing and American industry successfully competed against businesses in other countries. The turn to import tariffs is a way of invoking that nostalgia, the selective vision of a utopia that was exceptional, in terms of both U.S. and world history, and that conveniently conceals or overlooks many other aspects of that lost time, such as worker exploitation, Jim Crow racism, and widespread patriarchy inside and outside households. Ricardo used England and Portugal as an example. Even if Portugal was better than England at producing both wine and cloth, if Portugal had a larger advantage in wine production, Portugal should export wine and import cloth. Both nations would end up better off. The same principle applies to people. Given his athletic prowess, Roger Federer may be able to mow his lawn faster than anyone else. But that does not mean he should mow his own lawn. The advantage he has playing tennis is far greater than he has mowing lawns. So, according to Ricardo (and common sense), Mr. Federer should hire a lawn service and spend more time on the court. That’s the basis of neoclassical utopianism—the gains from trade: when international trade is unregulated, and every country specializes according to its comparative advantage, more commodities can be produced at a lower cost and as a result average living standards around the world are improved. 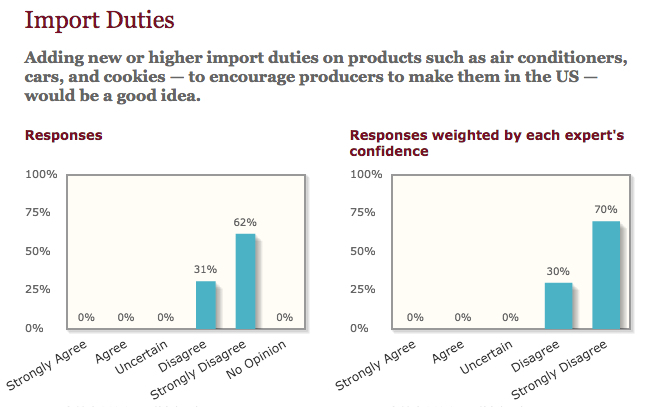 Like Mankiw, most mainstream economists, who are the only ones represented in the IGM Economic Experts panel, oppose import tariffs (as seen in the chart above) and celebrate the utopianism of free international trade. That’s true even among mainstream economists who have argued that, in reality, the causes and consequences of international trade may not coincide with the rosy picture produced within the usual textbook versions of neoclassical economic theory. For example, Paul Krugman was awarded the Nobel Prize in economics for his work demonstrating that the relative advantages most neoclassical economists take as given are in fact products of history. Thus, it is possible for countries to enhance their trade advantages (through creating internal economies of scale) by regulating international trade. But Krugman was also quick to belittle “a steady drumbeat of warnings about the threat that low-wage imports pose to U.S. living standards” and, then, in his first New York Times column, to denounce the critics of the World Trade Organization. If our economic rules empower corporations and financial interests excessively, then the correct response is to rewrite those rules — at home as well as abroad. If trade agreements serve mainly to reshuffle income to capital and corporations, the answer is to rebalance them to make them friendlier to labor and society at large. The goal is to make sure everyone, not just “corporations and financial interests,” benefits from international trade. But recent criticisms of trade deals from within mainstream economics still don’t include the possibility that capitalism itself, with or without free international trade and multinational trade agreements, however the rules are written, privileges one class over another. Capital gains at the expense of workers because it is able to extract a surplus for literally doing nothing. That kind of social theft occurs—both when international trade is regulated and controlled and when it is allowed to operate free of any such interventions. If the free-traders cannot understand how one nation can grow rich at the expense of another, we need not wonder, since these same gentlemen also refuse to understand how within one country one class can enrich itself at the expense of another. Do not imagine, gentlemen, that in criticizing freedom of trade we have the least intention of defending the system of protection. One may declare oneself an enemy of the constitutional regime without declaring oneself a friend of the ancient regime. Moreover, the protectionist system is nothing but a means of establishing large-scale industry in any given country, that is to say, of making it dependent upon the world market, and from the moment that dependence upon the world market is established, there is already more or less dependence upon free trade. Besides this, the protective system helps to develop free trade competition within a country. Hence we see that in countries where the bourgeoisie is beginning to make itself felt as a class, in Germany for example, it makes great efforts to obtain protective duties. They serve the bourgeoisie as weapons against feudalism and absolute government, as a means for the concentration of its own powers and for the realization of free trade within the same country. That’s because Marx’s critique of political economy embodied a utopian horizon radically different from the utopianism of classical and neoclassical economics. He sought to transform economic and social institutions in order to eliminate capitalist exploitation. 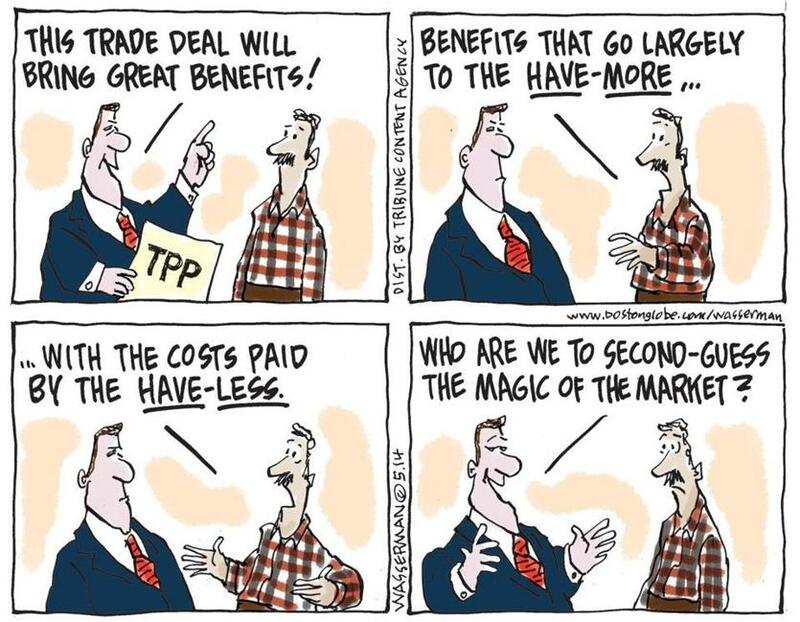 And if free trade was the quickest way of getting to the point when workers revolted and changed the system, then he would vote against protectionism and in favor of free trade. As it turns out, as Friedrich Engels explained forty years later, both protectionism and free trade serve, in different ways, to produce more capitalist producers and thus to produce more wage-laborers. In our own time, Trump’s protective tariffs may do that in the United States, just as free trade has accomplished that in other countries that have increased their exports to the United States. 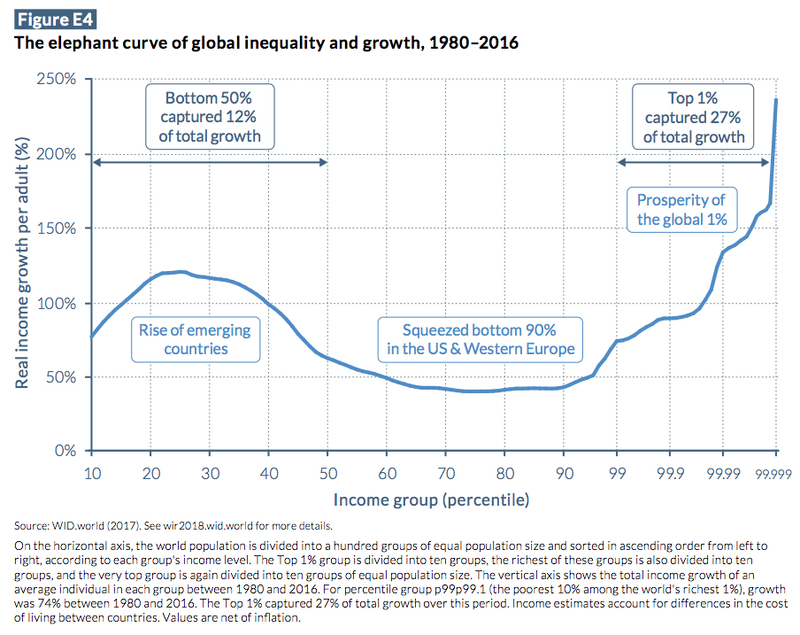 But neither protectionism nor free trade can succeed in undoing the “elephant curve” of global inequality, which in recent decades has shifted the fortunes of workers in the United States and Western Europe and those in “emerging” countries and still left all of them falling further and further behind the top 1 percent in their own countries and globally. 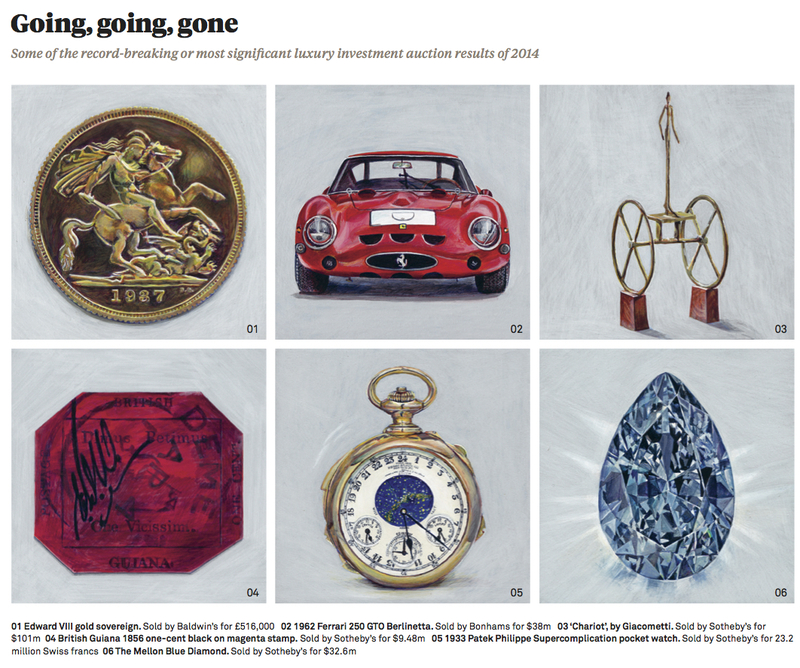 Reversing that trend is a goal, a utopian horizon, worth fighting for. And the Republican Congress. . . The premise and promise of the House and Senate versions of the Tax Cuts and Jobs Act are that lower corporate taxes will lead to increased investment and thus more jobs and higher wages for American workers. Accumulate, accumulate! That is Moses and the prophets! “Industry furnishes the material which saving accumulates.” Therefore, save, save, i.e., reconvert the greatest possible portion of surplus-value, or surplus-product into capital! Accumulation for accumulation’s sake, production for production’s sake: by this formula classical economy expressed the historical mission of the bourgeoisie, and did not for a single instant deceive itself over the birth-throes of wealth. But what avails lamentation in the face of historical necessity? If to classical economy, the proletarian is but a machine for the production of surplus-value; on the other hand, the capitalist is in its eyes only a machine for the conversion of this surplus-value into additional capital. Political Economy takes the historical function of the capitalist in bitter earnest. Except for one thing (as Bruce Norton has explained): Marx never presumed capitalists would follow any kind of fixed rule, including using their surplus-value to accumulate capital. That’s only what the mainstream economists of his day—classical political economists like Adam Smith and David Ricardo—attributed to, or at least hoped from, capitalists. They’re the ones who thought capitalists had a “historical mission” of accumulating capital. As I explained to students in class yesterday, you only get the accumulation of more capital out of corporate tax cuts if you assume everything else constant. where K* is the rate of capital accumulation (∆K/K), r is the rate of profit (surplus-value divided by the sum of constant and variable capital, s/[c+v]), and λ is the rate of all other distributions of surplus-value (including taxes to the state, CEO salaries, stock buybacks, dividends to stockholders, payments to money-lenders, and so on). So, yes, if you hold everything else constant, corporate tax cuts, and thus a lower λ, will lead to a higher K*. But that only works if everything else is held constant. If capitalists choose to use the tax cuts to increase CEO salaries, stock buybacks, and/or dividends to stockholders, then all bets are off. The Tax Cuts part of the act will not lead to the Jobs part of the act. And even if capitalists do use some portion of the tax cuts to accumulate capital, that will only result in new jobs if technology is held constant. However, if they use it to invest in newer constant capital (e.g., automation and other labor-displacing technologies), then again we’ll see few if any new jobs. And even if and when new jobs are created, the effect on workers’ wages will depend on the Reserve Army of Unemployed, Underemployed, and Low-Wage workers. 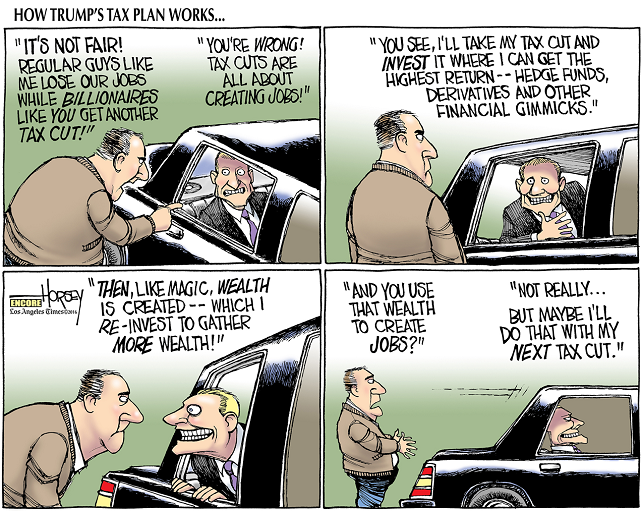 Clearly, there are lots of hidden steps and assumptions between slashing corporate taxes and more jobs. That’s why Donald Trump and House and Senate Republicans have decided not to even attempt to justify the tax cuts but only to ram it through Congress in the shortest possible time. They pretend they’re taking “the historical function of the capitalist in bitter earnest” but, in the end, they’re just attempting to line their benefactors’ pockets. Adam Smith’s Wealth of Nations makes for uncomfortable reading these days. That’s because, as my students this semester have learned, the father of modern mainstream economics—who has become so closely (and mistakenly) identified with the invisible hand—held a narrow theory of money and advocated extensive regulation of the banking sector. The gold and silver money which circulates in any country may very properly be compared to a highway, which, while it circulates and carries to market all the grass and corn of the country, produces itself not a single pile of either. The judicious operations of banking, by providing, if I may be allowed so violent a metaphor, a sort of waggon-way through the air, enable the country to convert, as it were, a great part of its highways into good pastures and corn-fields, and thereby to increase very considerably the annual produce of its land and labour. Moreover, Smith also argued, banks were susceptible to speculative crises. Thus, even in his system of “natural liberty,” the banking sector needed to be regulated, in order to lessen the likelihood of such crises and to minimize the suffering of the poor when they did happen. To restrain private people, it may be said, from receiving in payment the promissory notes of a banker, for any sum whether great or small, when they themselves are willing to receive them, or to restrain a banker from issuing such notes, when all his neighbours are willing to accept of them, is a manifest violation of that natural liberty which it is the proper business of law not to infringe, but to support. Such regulations may, no doubt, be considered as in some respects a violation of natural liberty. But those exertions of the natural liberty of a few individuals, which might endanger the security of the whole society, are, and ought to be, restrained by the laws of all governments, of the most free as well as of the most despotical. The obligation of building party walls, in order to prevent the communication of fire, is a violation of natural liberty exactly of the same kind with the regulations of the banking trade which are here proposed. Those warnings and regulations, of course, disappeared from contemporary mainstream economics—even as the financial sector continued to increase in size and significance within the U.S. economy. 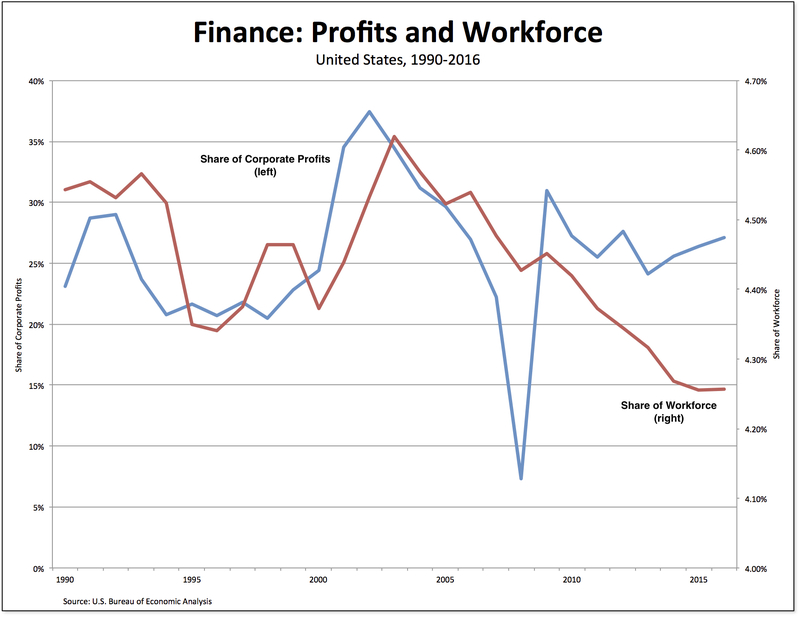 Today, financial profits (the blue line in the chart above) represent more than a quarter of total corporate profits in the United States, although the financial sector provides only 4.3 percent of American jobs (the red line in the chart). 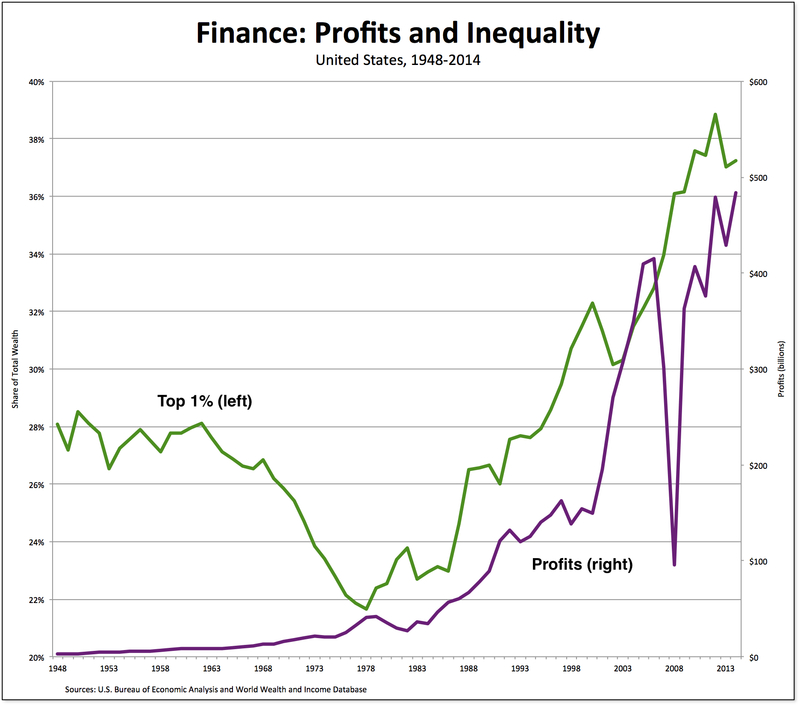 Moreover, as the profits of the financial sector (the purple line in the chart above) have grown—reaching still another record high of more than $500 billion in 2016—the distribution of wealth has become more and more unequal—such that, in 2016, the share of total wealth owned by the top 1 percent (the green line in the chart) was more than 37 percent. Nonfinancial firms as a whole now get five times the revenue from purely financial activities as they did in the 1980s. Stock buybacks artificially drive up the price of corporate shares, enriching the C-suite. Airlines can make more hedging oil prices than selling coach seats. Drug companies spend as much time tax optimizing as they do worrying about which new compound to research. The largest Silicon Valley firms now use a good chunk of their spare cash to underwrite bond offerings the same way Goldman Sachs might. The fact is, financial wheeling and dealing has—after a brief interlude—returned as the tail that wags the economic dog in the United States. It manages to capture an outsized share of profits, even as it creates increased instability and obscene levels of inequality. It should be clear to all that finance has been fundamentally transformed since Smith’s day, from a highway that was supposed to serve us into a master that we serve. And, not surprisingly, many others—from heterodox economists to artists—have challenged the whole notion of the invisible hand. But one of the best critiques of the invisible hand I have encountered can be found in Kim Stanley Robinson’s story, “Mutt and Jeff Push the Button” (which appears in Fredric Jameson’s recent book, An American Utopia: Dual Power and the Universal Army). *As I have discussed before, the invisible hand is a powerful metaphor “for which neoclassical economists have worked very hard to invent a tradition beginning with Adam Smith.” Smith himself only used the term twice in his published writings—once in The Theory of Moral Sentiments and again in The Wealth of Nations—and never to refer to a self-equilibrating market system, which is the way the term is used by mainstream economists today. Every economic theory includes—or, at least, is haunted by—the distinction between productive and unproductive labor. The distinction serves as the basis of all their major claims, from the most basic theory of value to the conception of who deserves what within capitalism. The distinction began with the French Physiocrats, especially François Quesnay, who in his 1758 Tableau Économique made a distinction between the “Productive” Class (which consisted of agricultural producers) and two other groups: the “Proprietary” class (which consisted of only landowners) and the “Sterile” class (which was made up of artisans and merchants). The idea was that all new value was created only by agricultural producers, not by industry or commerce. 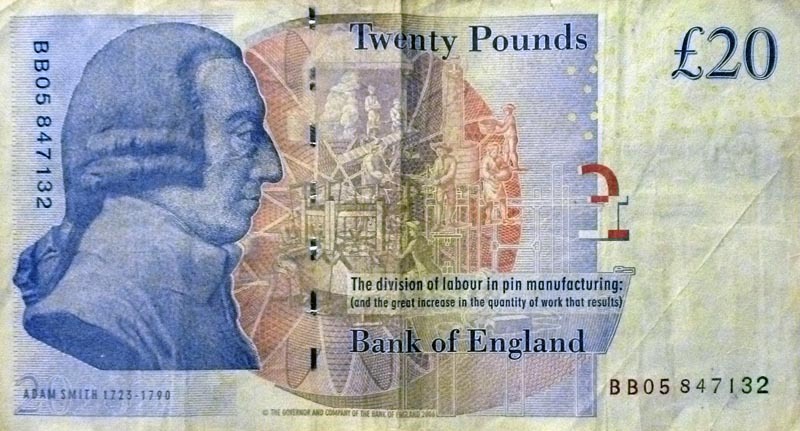 It was then picked up by Adam Smith, who criticized the Physiocrats for overlooking the important contribution of manufacturing to the wealth of nations. While Smith broadened the concept of productive labor (to include both agriculture and industry), he retained the notion of unproductive labor (especially the “menial servants” he worried industrial capitalists would waste their profits on, thus undermining their “historic mission” to accumulate capital). That statement made me stop. “Perfectly unproductive labor”? But that “unproductive labor”, as every economist knows, improves the allocation of goods. The goods flow toward those who have greater ability to pay and since we tend to associate greater ability to pay with greater utility, the goods, thanks to bachaqueros’ activities, are better allocated. If one argues that bachaqueros activity is unproductive because it “does not increase the supply of anything” then one should argue that the activity of any trade or intermediation is unproductive because it does not produce new goods, but simple reallocates. The same argument could be used for the entire financial sector, starting with Wall Street. The entire activity of Wall Street has not produced a single pound of flour, a single loaf of bread or a single sofa. But why we believe that financial intermediation is productive is that it allows money to flow from the places where it would be less efficiently used to the places where it would be used more efficiently. Or for that matter from the consumers who cannot pay much to the consumers who can. Exactly the activity done bybachaqueros. Milanovic is right: if “bachaqueros” are unproductive, why isn’t the labor of the financial sector? Or, more generally, of FIRE (finance, insurance, and real estate)? Or of CEOs and other corporate managers? That’s exactly the reason neoclassical economists generally don’t make a distinction between productive and unproductive labor. They want to see it all as productive: manufacturing, services, commerce, and finance; factory workers, office workers, and CEOs. The difference, in Hausmann’s case, is he wants to criticize the socialist economic policies of the Venezuelan government. So, the veil falls and even he, against the dictates of his own economic theory, invokes the distinction between productive and unproductive labor. But once that door is open, who knows what ideas might follow? What happens if we begin to conceive of many kinds of labor and whole groups of economic agents within contemporary capitalism not only as unproductive, but as parasitical and even downright destructive? *But note, because this point is often missed, Marx is not making a distinction between goods and services. Both can and often do involve productive labor. An actor, for example, or even a clown, according to this definition, is a productive labourer if he works in the service of a capitalist (an entrepreneur) to whom he returns more labour than he receives from him in the form of wages; while a jobbing tailor who comes to the capitalist’s house and patches his trousers for him, producing a mere use-value for him, is an unproductive labourer. The former’s labour is exchanged with capital, the latter’s with revenue. The former’s labour produces a surplus-value; in the latter’s, revenue is consumed. **However, there are forms of labor—such as that performed in households—that are not included in the usual neoclassical-inspired national-income accounts. One can argue, then, that neoclassical economics does retain some notion of unproductive labor. It’s the beginning of the semester and so, in Topics in Political Economy, we’re starting with Adam Smith’s Wealth of Nations. According therefore, as this produce, or what is purchased with it, bears a greater or smaller proportion to the number of those who are to consume it, the nation will be better or worse supplied with all the necessaries and conveniencies for which it has occasion. But this proportion must in every nation be regulated by two different circumstances; first by the skill, dexterity, and judgment with which its labour is generally applied; and, secondly, by the proportion between the number of those who are employed in useful labour, and that of those who are not so employed. Whatever be the soil, climate, or extent of territory of any particular nation, the abundance or scantiness of its annual supply must, in that particular situation, depend upon those two circumstances. There is one sort of labour which adds to the value of the subject upon which it is bestowed: there is another which has no such effect. The former, as it produces a value, may be called productive; the latter, unproductive labour. Thus the labour of a manufacturer adds, generally, to the value of the materials which he works upon, that of his own maintenance, and of his master’s profit. The labour of a menial servant, on the contrary, adds to the value of nothing. The students (at least some of them) didn’t buy it. What Smith and contemporary neoclassical economists agree on is both a definition of and a focus on economic growth. It’s a key part of the legitimacy of the “pact with the devil” that is central to capitalism. Wealthy individuals (and the corporations they own and on whose boards of directors they sit) get control of the surplus but they have to use it to employ the population and provide for their “necessaries and conveniencies.” If they don’t, and use it instead to purchase art, real estate, and other luxury goods, they put into question the legitimacy of that pact. 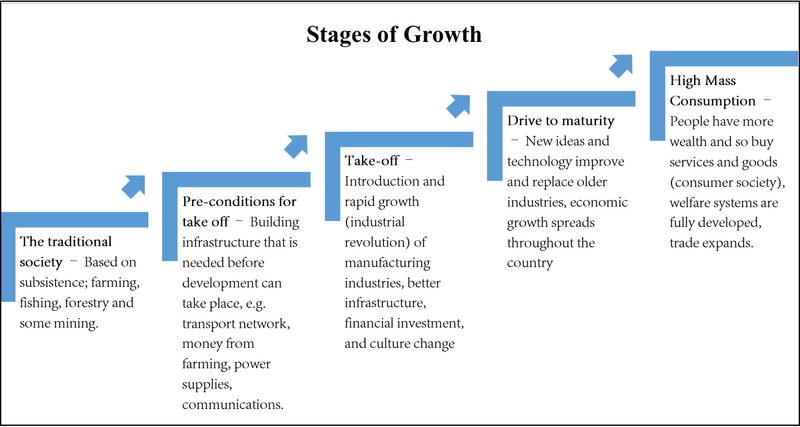 In recent years, economic growth has been very slow. But 1-percent incomes and their luxury consumption are growing, while median household incomes and workers’ wages are stagnant. That’s a situation that would have worried Smith. *Marx took over the distinction between productive and unproductive labor from Smith but then transformed it. For him, labor was productive to the extent that it produced surplus-value; all other labor (e.g., the labor of corporate managers as well as that of personal servants) was unproductive labor. ***Their suspicion might also be influenced by a belief in trickledown economics, that is, the idea that whatever investments and purchases wealthy individuals make will eventually trickle down to the mass of workers.